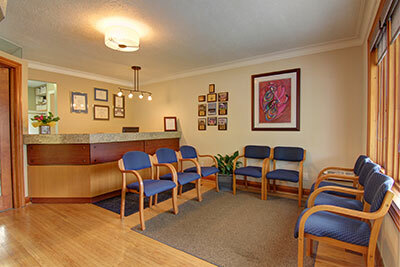 Providing quality, routine dental care and maintenance is at the core of any distinctive dental practice. In fact, it is the foundation of everything we do. Dr. McTague’s dental team is focussed first and foremost on the prevention of dental disease; we firmly believe that an ounce of prevention is worth a pound of cure. Continuing care appointments (“check-ups” and cleanings), preferably every 6 months, are essential for identifying small problems before they become bigger ones. Better yet, our team can often identify potential problems before they occur and prevent their development entirely. When problems do occur, however, the treatment that our team can provide runs across the very broad spectrum of dental services that exist. Our office performs many oral surgery procedures, root canals, periodontal (gum) care, dentures, and of course basic and advanced restorative procedures (to name a few!) to return your oral health to optimal levels, taking advantage of the many benefits that modern technology has to offer. Everyone in the family is welcome at our office. We treat patients who are less than a year old, to those 99 years young. Every stage of life has its unique dental circumstances and challenges, and it is important that your dental team be knowledgeable of these considerations and able to provide you with the necessary tools and advice every step along the way. Our team of professionals is here to assist you. Comprehensive treatment beyond routine care may be required for a number of reasons. Traumatic events can result in sudden tooth loss or damage. Dental decay, periodontal disease, and destructive habits such as clenching and grinding, among other things, can lead gradually to an unstable dentition and deteriorating oral health. This, in turn, can result in discomfort, loss of chewing efficiency, difficulty with certain speech sounds and an unattractive smile. Achieving a stable, predictable, and satisfactory result requires addressing these issues with a very thorough and disciplined approach. A complete examination with study models of your teeth allows for visualization of all the problems and the formulation of a sequenced treatment plan. Occasionally, a multi-disciplinary approach is required, involving specialists such as orthodontists, oral and maxillofacial surgeons, and periodontists, who will work in co-ordination with Dr. McTague to ensure the desired results are achieved. If you have concerns that your oral health and smile are not as good as they once were, be sure to bring it to our team’s attention so that you can receive the care that you deserve. A smile is one of the simple things in life that can be taken for granted until something happens and it’s no longer what it once was. Some may have never been happy with their smile and always wished they could do something about it. The good news is that modern dental materials and techniques have given us the opportunity to change lives, giving people the confidence to show the world their true character. Most people would agree that a beautiful smile can be a very positive influence in one's life. In fact, in a recent survey of the American Academy of Cosmetic Dentistry (AACD), virtually everyone polled (99.7%) stated that a smile was an important social asset, and approximately 75% believed that an unattractive smile could hinder a person’s chances for career success. Cosmetic dentistry covers a broad breadth of procedures. The most common cosmetic procedure is whitening, a safe and easy way to brighten the shade of one’s teeth. Beyond this, common procedures include bonding, porcelain laminate veneers, porcelain crowns and bridges, as well as the recontouring of gum tissue to restore the soft tissue aesthetics of the smile. Dr. McTague is an advocate for the concept that form follows function. Therefore, he is careful to ensure that the mouth functions well before any cosmetic procedures are undertaken. Only when the parameters of form, function and health are met can a smile be truly beautiful and durable. The masticatory (chewing) system involves several structures and tissues involving the upper and lower jaws. The jaws connect in two distinct places: at the teeth, and at the jaw joints called the Temporo-Mandibular Joints, or TMJs. As a result of this relationship, problems involving the teeth can affect the TMJs and, conversely, problems involving the TMJs can affect the teeth. A thorough understanding of these joints and their relationship to the rest of the masticatory system is essential to having stable and predictable dental care. Dr. McTague includes an assessment of the TMJs in every new patient exam, and will explain to you in detail any concerns that may exist. Our goal with any of our young patients is essentially the same as with the rest of our patients: to have a healthy and comfortable smile throughout their entire lives. Of course, for this to occur, it is very important that regular visits be made to the dentist throughout their lifetime. There are many people who do not make regular dental visits. When these people are asked why they avoid the dentist, by far the most frequent answer is…FEAR!... and everyone suffering from this anxiety reports that it was caused by a traumatic medical or dental experience as a child. So, it just seems to us that the best way to have your children’s teeth last a lifetime is to avoid bad experiences in the dental office. Our paramount goal is to provide your kids with the best experience possible. The attending parent can be a valuable support, especially for very young children. However, children often become overwhelmed when there appears to be more than one leader in the room. Therefore, we kindly ask that the attending parent remain as passive as possible and redirect any questions that your child may ask of you back to Dr. McTague. He and his assistants have a very well-rehearsed routine that works extremely well. Please do not try to prepare your children for the upcoming appointment beyond telling them simply that they will be visiting the dentist. Dr. McTague and his team always practice a ‘Tell, Show, Do’ method that has proven quite successful over the years. In our office we take care to never use the “P” word (pain) or the “H” word (hurt) because, without any prior suggestion otherwise, a child would have no reason to connect a visit to the dental office with these uncomfortable sensations. In fact, for most kids, a trip to the dental office is quite enjoyable and something of an adventure. Modern dentistry has virtually eliminated discomfort, and to mention these words will usually cause a child needless distress. Your assistance in this regard would be very helpful and appreciated. Lastly, we are often asked ‘why would you bother to repair baby teeth when they’re only going to fall out anyways?’. In fact, primary teeth are quite important: they allow for efficient chewing (especially important when young people are prone to choking); their presence and functioning contribute to the growth and development of the jaws, they help prevent orthodontic problems by maintaining space for the future growth of the permanent teeth, and their absence may have a detrimental effect on the child’s self-esteem. So, as you can see, the primary teeth are important and deserve similar attention as permanent teeth.